There is something so comforting about an old-fashioned, from scratch, layered coconut cake. Just the photo of one invokes warm memories of family gatherings, special celebrations, and Sunday lunches when special company was coming. I can’t tell you how often I’m asked, “I follow my grandmother’s recipe exactly, but it doesn’t taste the same. What am I doing wrong?” We’ll answer this question and share this time honored recipe together. It’s velvety, smooth, and decadently delicious. Warning: Once you’ve made this chocolate pie, there’ll be no going back! Sometimes you’ll make it just for yourself! 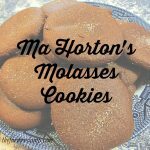 This is another recipe from my great-grandmother, Ma Horton. It seems almost everyone has a pie crust recipe that’s “The easiest, best crust ever.” I don’t know about you, but making homemade pie crust was always a chore for me. I just bought the “unroll” in the pan kind. After we cut all processed foods and GMOs from our home, that wasn’t an option any more. After much trial and error, I found the secret.